In this tutorial, we will see the difference between OpenVPN TUN and TAP modes and why use one or another. Finally we will see how to setup an OpenVPN server in TAP mode behind a firewall Cisco ASA. Tun stands for network TUNnel. The term "tun" mode also refer to routing mode and operate with layer 3 packets. 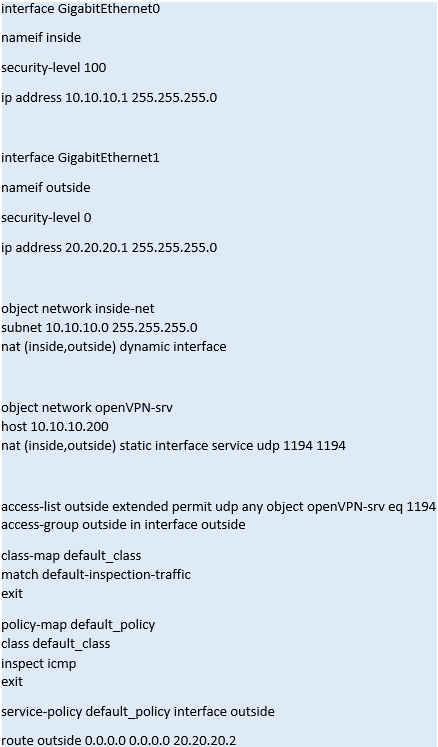 In routing mode, the VPN client is given an IP address on a different subnet than the local LAN where the OpenVPN server is sitting. This virtual subnet is created for connecting to any remote VPN computers. In routing mode, the OpenVPN server creates a "tun" interface with its own IP address pool which is different from the local LAN. Client 1 will get an IP address inside the 10.0.8.0 network and will have access only to the server where OpenVPN resides. 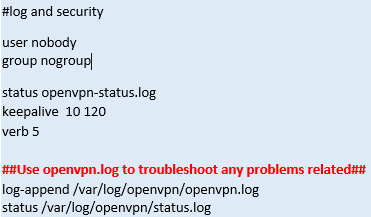 The problem with TUN mode is that OpenVPN client cannot communicate with other local LAN resources. 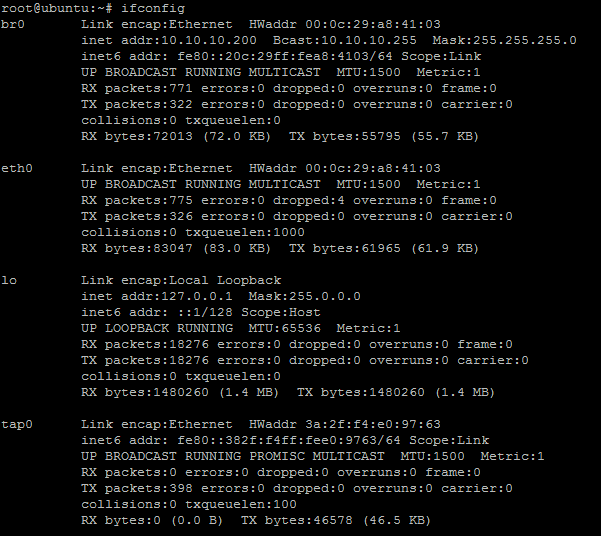 Local LAN machines already have a default gateway (10.10.10.1) while OpenVPN client's default gateway is 10.0.8.1. 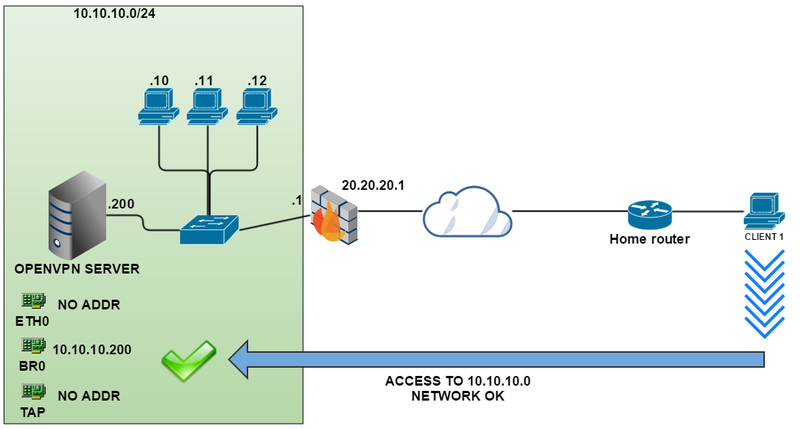 If an OpenVPN client sends a packet destined to 10.10.10.11, the destination device will receive that packet and see that the packet is coming from an IP address outside of its own local LAN and would send any reply packets to their gateway (10.10.10.1) instead of sending the packets back to OpenVPN server. The only way for a local machine to communicate with an OpenVPN client in TUN mode is to define a static routes on it. But it is a bit too extravagant. The other conventional solution is TAP mode. The term "tap" mode refer to bridge mode and operates with layer 2 packets. In bridge mode, the VPN client is given an IP address on the same subnet than the LAN where reside the OpenVPN server, giving the OpenVPN client direct access to other LAN resources. 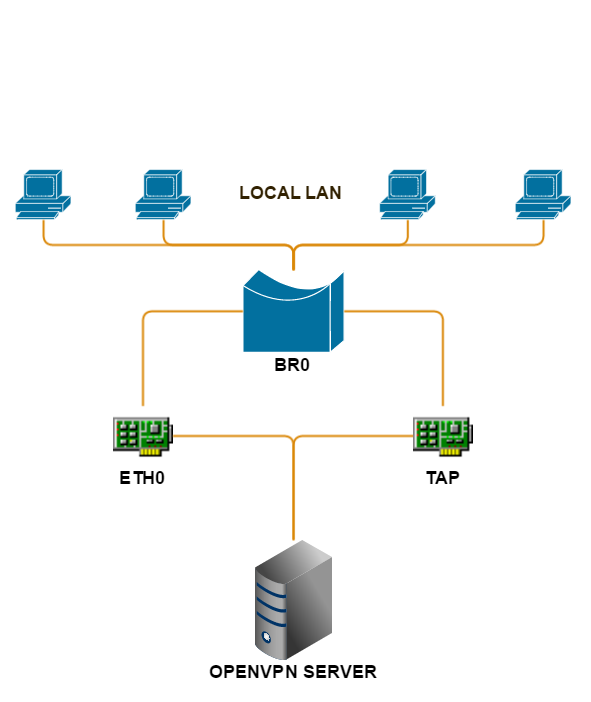 In bridge mode, the OpenVPN server creates two logical interfaces, "br0" and "tap". The role of the "br0" interface is to link the "eth0" interface to the "tap" interface. When that link is established, both "eth0" and "tap" interfaces are communicationg through "br0". Client 1 will get an IP address inside the 10.10.10.0 network and will have access to all resources and internet through the OpenVPN server. 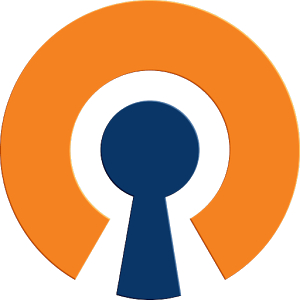 If you want to give remote access to a single server to multiple clients without the need to access to remote LAN resources, OpenVPN TUN mode is the simplest solution. If you want to give remote access to the entire remote LAN to multiple clients, you need to setup OpenVPn in bridge mode. OpenVPN can be setup as VPN server and firewall (IpTables or UFW) or behind a firewall (ASA5520 IOS 8.4.2 here) performing NAT and protecting our network from the internet. Here OpenVPN server will have a LAN ip address of 10.10.10.200 and will listen on port 1194 (default). 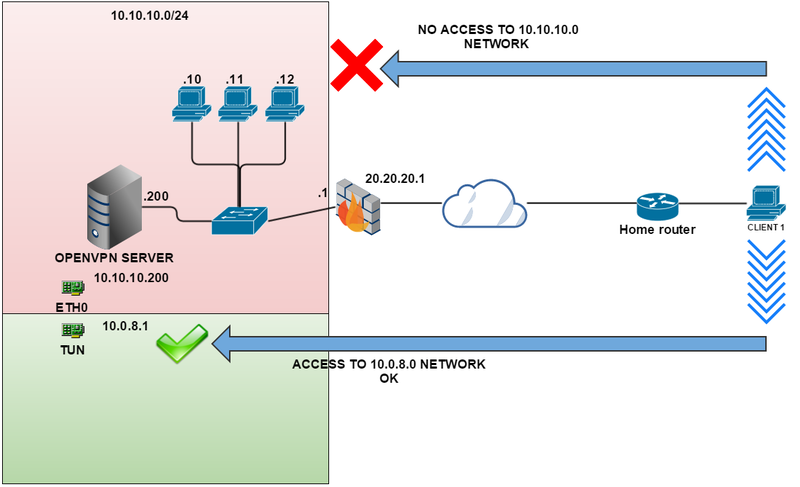 We will need a static port forwarding on the ASA to allow outside incoming connection to port 1194 to the OpenVPN server. This tutorial is using Ubuntu server 15.04. The configuration is the same on all debian distributions. 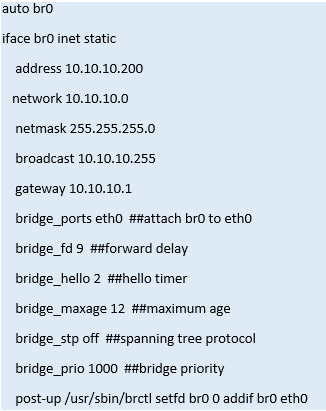 As we discussed earlier, the bridge interface is a logical interface that link TAP and Eth0 interfaces together allowing OpenVPN clients to have an IP address in the same local LAN for accessing local resources. The vars file contains all necessary information used by PKI to generates server and client certificates and some other files. 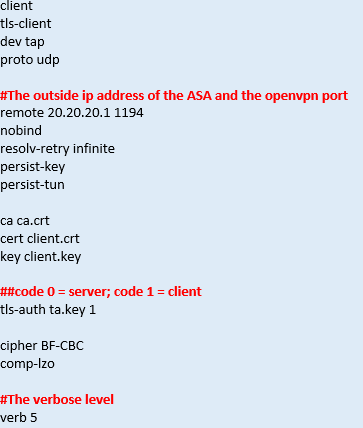 Copy the files ca.crt, client.crt, client.key, ta.key to your windows client in the OpenVpn "config" directory in "C:\Program files\OpenVPN\config"
Now you can connect your client to OpenVPN. You should have a similar network configuration on your server.